Throughout history, countless women have boldly stepped out in faith and courage, leaving their indelible mark on those around them and on the kingdom of God. 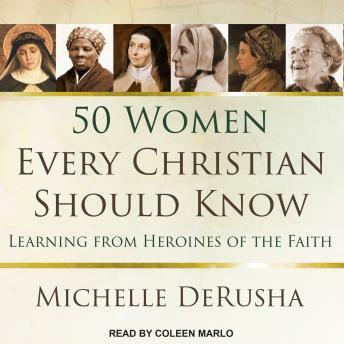 In lively prose Michelle DeRusha tells their stories, bringing into focus fifty incredible heroines of the faith. From Catherine of Siena, Teresa of Avila, and Anne Hutchison to Susanna Wesley, Harriet Tubman, and Corrie ten Boom, women both famous and admirable live again under DeRusha's expert pen. These engaging narratives are a potent reminder to listeners that we are not alone, the battles we face today are not new, and God is always with us in the midst of the struggle.